COMBATSIM.COM | The Ultimate Combat Simulation and Strategy Gamers' Resource. Ubisoft has announced that Fields of Elysium, the first episode of the second post-launch story arc of Assassin’s Creed Odyssey, The Fate of Atlantis, is now available across all available platforms. Throughout Fields of Elysium, players will continue their odyssey in the Greek afterlife to uncover the great mysteries within the ancient realms of the gods. Fields of Elysium introduces players to the paradise of Elysium, an otherworldly realm of luscious growth and no conflict, ruled by the goddess Persephone. As the story unfolds, players uncover its sinister secrets while trying to unlock the power of the Staff of Hermes to find a way out of Elysium. Helping Hermes, Persephone’s friend Hekate, and the human Adonis, players uncover the true nature of Elysium as it inevitably descends into civil war. Ares Bull Charge: Part of the Warrior branch of the skill tree. This ability enhancement summons a projectile that takes the form of a bull charging forward. The projectile knocks down any enemy it hits and pierces though them. Ares Madness: Also part of the Warrior branch of the skill tree. Ares Madness will allow players to have a new fighting set that overpowers their enemies for a short period of time. Might of Artemis: Part of the Hunter branch of the skill tree. Enemies, when hit by the stun, automatically take critical damage from any subsequent melee attack for the duration of the stun. Kronos Time Warp: Part of the Assassin branch of the skill tree. This ability will grant each head shot additional slow-down time and higher damage, which is perfect for fighting enemies. Otherwise, players will be able to use a shortcut created specifically for those who would like to play The Fate of Atlantis and who do not fulfill all the above conditions. Thanks to this shortcut, players will enter Greece at Level 52 with preset abilities and resources enabling them to start their adventure into the afterlife with the Lost Tales of Greece questline Heir of Memories. They will also have the opportunity to choose their hero. However, unlike the previous option, player progression using the shortcut will not carry over to the main game save, and they will not be able to obtain achievements. The Assassin’s Creed Odyssey post-launch plan is the biggest and most ambitious in the franchise, and season pass owners are able to access two major episodic storylines, Legacy of the First Blade and The Fate of Atlantis. Players can dive into new episodes as they are released or experience the epic adventures in their entirety once all episodes are available. The season pass also includes Assassin’s Creed® III Remastered and Assassin’s Creed® III Liberation Remastered, which released for the PlayStation®4 computer entertainment system, the Xbox One family of devices including Xbox One X and Windows PC on March 29th, 2019. For more information on Assassin’s Creed, please visit assassinscreed.com. NVIDIA has launched worldwide its new entry level GeForce GTX 1650, giving you smooth performance on the latest games. With the GTX 1650 pricing starting at $149, the GTX 1650 is the great choice for gamers looking for a quick, easy upgrade, or those building a compact, power-efficient system able to play modern games. Like its other GeForce GTX 16-series siblings, the GTX 1650 is derived from the “Turing” architecture, but without RTX real-time raytracing hardware, such as RT cores or tensor cores. NVIDIA has not made a Founders Edition for GTX 1650. So the following reviews will be custom designs from various manufacturers. We’ve searched the web and posted the links to those reviews below. AMD has released the latest in their driver suite, which brings about improved performance and support for Mortal Kombat 11 – that means gory details in full GPU-acceleration for the best possible gaming experience. Apart from that, not much to see here: there’s a fixed issue relating to AMD Link and Radeon Settings sometimes displaying incorrect parameters. The list of known issues is slightly larger, and follows after the break. The new Radeon Software Adrenalin 2019 Edition 19.4.3 drivers are available online at the AMD driver download page. NVIDIA has rolled out its GeForce 430.39 WHQL drivers, which introduce support for the new GeForce GTX 1650 graphics card launched earlier today. The drivers also add support for the new notebook variants of the GTX 1660 Ti and GTX 1660. Most importantly, the drivers add support for Windows 10 May 2019 Update (1903), which adds a standardized method of variable-rate shading. The drivers add or improve optimization for “Mortal Kombat XI,” “Anthem,” and “Strange Brigade.” NVIDIA tested and approved 7 more VESA Adaptive Sync-capable monitors for G-Sync support added through these drivers (full list here). Among the other features is the new ability to merge two portrait monitors to a landscape display head. Fixes include MadVR not correctly rendering HDR mode using MPC-HC; a random desktop flicker seen in some multi-display PCs, and memory leaks noticed when launching certain games. You can download the new GeForce 430.39 WHQL drivers through GeForce Experience or via GeForce.com. Independent developer and publisher Eugen Systems announced today plans to delay the launch for Steel Division 2, the sequel to the critically acclaimed real-time strategy title Steel Division: Normandy 44. Players who pre-ordered a Digital Deluxe Edition of Steel Division 2, can now look forward to playing the final version of the game on June 18, 2019 before the wide release of the Standard Edition on June 20, 2019. For an independent studio, this decision was not made lightly. The decision to delay the Steel Division 2 launch will afford the development team additional time to focus on improving the Army General mode. This single player campaign mode has grown over the course of development and is shaping up to be an entirely new game-within-a-game. Steel Division 2 fans can expect more details on the progress concerning the Army General mode soon this month and are encouraged to keep an eye on the official Steel Division 2 news feed on Steam for Developer Diaries on the topic. In addition, the new launch date will allow Eugen Systems to deliver on direct requests from players for more frequent and extended beta phases. With more development time, Eugen Systems will focus on addressing direct requests and feedback from beta players to create the best possible single- and multi-player experiences when Steel Division 2 launches. Starting on May 29, the Steel Division 2 beta will remain open and uninterrupted until the final game launch on June 20. Until then, Steel Division 2 fans can also look forward to regular updates and additional beta phases as development continues. For details on the upcoming beta phases and more on the recent delay announcement for Steel Division 2, please head to the page on Steam. 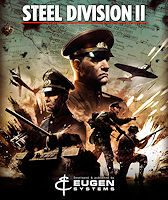 For full details on pre-order bonuses for Steel Division 2, please head to the official website at buy.steeldivision2.com. Steel Division 2 is the sequel to the critically acclaimed real-time strategy title Steel Division: Normandy 44. Set during Operation Bagration on the Eastern Front in the summer of 1944, Steel Division 2 pushes the limits of the World War II tactical experience, delivering new 1:1 scale Dynamic Strategic Campaigns. Command entire armies during Operation Bagration, covering the Soviet counter-attack against Axis forces in Byelorussia. Battle in the multiple skirmish modes on 25 maps and customize your battlegroups in the brand-new deck system, allowing for an unprecedented level of customization. To stay up to date on the latest regarding Steel Division 2, be sure to visit the game’s official website. In light of Monday’s events, we will be donating €500,000 to help with the restoration and reconstruction of the Cathedral. We encourage all of you who are interested to donate as well. In addition, we want to give everyone the chance to experience the majesty and beauty of Notre-Dame the best way we know how. For one week (April 17th to April 25th), we will be giving Assassin’s Creed: Unity away free on PC, for anyone who wants to enjoy it. You can download it now for Uplay PC HERE. When we created Assassin’s Creed: Unity, we developed an even closer connection with this incredible city and its landmarks – one of the most notable elements of the game was the extraordinary recreation of Notre-Dame. The team at Massive Entertainment has announced that, in order to ensure the best experience for Division 2 players, they are creating a Public Test Server to test new features and fixes before they are implemented. The PTS will be available to anyone who owns The Division 2 on PC, starting on Wednesday, April 17, and the developers will use feedback from players’ play sessions, surveys, and forum threads to improve the updates and address any issues that arise. (Operation Dark Hours will not appear on the PTS, in order to ensure that the entire community can explore it at the same time.) The full PTS schedule will be announced soon. Furthermore, the team is moving the release of Title Update 3, which includes Operation Dark Hours (the eight-player raid) from April 25 to May 2019. They will use the extra time to perform further testing and balancing. Visit the official site for more details from the development team. Gear up for an adrenaline fueled adventure in the all-new Dare Devils of Destruction DLC for Just Cause 4, releasing April 30th, 2019, on XBOX ONE®, the all-in-one games and entertainment system from Microsoft, PlayStation®4 computer entertainment system and Windows PC. Watch the Just Cause 4 Dare Devils of Destruction Trailer HERE. For more information on the Gold Edition, visit the Just Cause 4 website. On Intel’s desktop Z390 chipset, there are around 7 different ATX sized motherboards to choose from in the $180-200 price bracket. This not only puts pressure on manufacturers to deliver a high blend of premium features for a better price than the competition and use unique visuals like a peacock’s plume to entice users. GIGABYTE’s Z390 Aorus Pro WIFI is one with its $195 price tag. 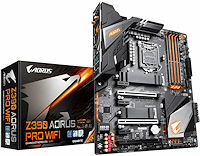 The Aorus brand is aimed squarely at gamers and the Z390 Aorus Pro WIFI looks to stake GIGABYTEs claim in a highly contested segment with a premium feature set at an affordable price.